This topic provides an overview of the Gallery module. For an overview of Gallery and to learn about the types of experiences that can be created, attend Training on Demand: Introduction to Gallery. To access the Gallery module, login to Video Cloud Studio and click Gallery in the navigation menu. Before you can create a Portal experience, you MUST configure the Gallery settings. 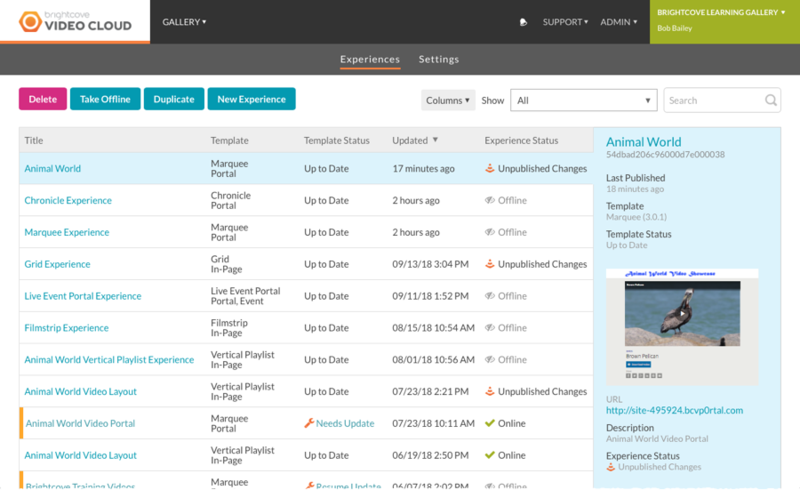 When opening the Gallery module, the Experiences page will display by default. If no experiences have been created, you will be prompted to create a new experience. For an overview of the types of experiences that can be created, see Overview of Gallery Experiences. To learn more about creating and managing Gallery experiences, see Creating and Managing Gallery Experiences. When creating a portal experience, Gallery must be configured with a default player. To learn more about Gallery settings, see Configuring Gallery Settings.